BACnet and the NexSys® -Before you order, read this. Power cord, plug outlets and detached plumbing make installation easy. There is plenty of protected room inside the enclosure for electrician wiring. 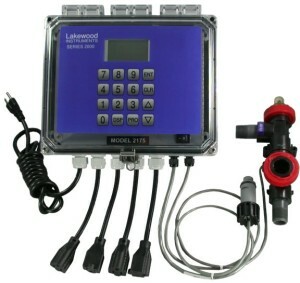 Two water meter inputs, conductivity input with 4-electrode conductivity sensor with 20 ft cable, flow switch input, four relay outputs, and Power On/Off switch are all standard features. Removable power cord and receptacles for simple conduit installations. Includes four relays for bleed, chemical feed, and alarms; expandable up to 12 relay outputs. Includes three security levels to prevent unauthorized programming access. Includes two languages; English/Spanish are standard. Heavy-duty stainless steel domed numeric keypad and large illuminated graphical display allow for quick and easy programming. Steel domed switches improve the tactile sensing and life expectancy of the keypad. Easy to program with the Lakewood plain English, intuitive, and user friendly menu interface. Expandable in the field with the use of the Nodes for additional inputs, such as chiller loop monitor and cycles of concentration based on incoming makeup water or additional outputs such as 4-20 mA and remote communications. Able to feed chemicals by multiple feed schemes including biocide addition, setpoint control, percent of blowdown, percent of time, and by water meter. Able to bleed based on setpoint or by water meter. Includes sensor fouling compensation and alarm. 2175e LonWorks® Technology-based conductivity and water meter actuated chemical feed controller. The 2175e has built-in options for feed on conductivity, by feed schedule, blowdown or makeup. Totalizing of makeup and blowdown, and three security levels are standard features. Conductivity range is 0-5,000 µS. -PS +24 volt power supply required for 3 or more nodes. -RS2L Communications node with LRWS program. -35L Two 4-20 mA output configurable for remote data acquisition of conductivity. -NIN Network interface node. Allows 2 NRLY, 1 Makeup NCON, 4 sensor nodes (NpH or NCON), 2 N420I and or 2 NDIG to be added. 2KIN-V1 Card to connect controller to LON based systems or gateways. LANGUAGE OPTIONS (optional, choose one, English and Spanish Standard)-EF English and French. NpH pH/ORP node for a pH or ORP sensor. N420I 4-20 ma input node for up to four 4-20 ma inputs. NDIG Digital input node for up to four digital inputs. NCON Conductivity node for makeup water or closed loop control (node only). NCKT Conductivity node for makeup water or closed loop control with PVC sensor, tee and enclosure. Maximum water pressure and temperature is 140 psi @ 100°F (9.7 bar @ 38°C). NOTE: NOT FOR USE WITH MULTIPLE COOLING TOWERS. LRWS Windows-based software program for computer to communicate with 2000 Series. WEBNode IP/TCP device for use with 2000 Series controllers. EZWeb Wireless internet interface for use with WEBNode and 2000 Series controllers.